Has everyone heard of The Wood Connection? Its a super fun blog full a great wood craft inspiration AND for those who are lucky enough to live nearby, its also a fantastic shop where you can buy all kinds of unfinished wood kits. Well, last week we had our monthly neighborhood craft night and I was asked to pick the theme. Of course I picked wood crafts! And since I had heard so many great things about The Wood Connection's Shop, I decided I better check it out. Oh my word... Died and gone to heaven!!! They have the cutest stuff and it is so nice to be able to just buy the kits all ready to go and just put your own spin on them. And I was pleasantly surprised with their prices. It was a really good day! 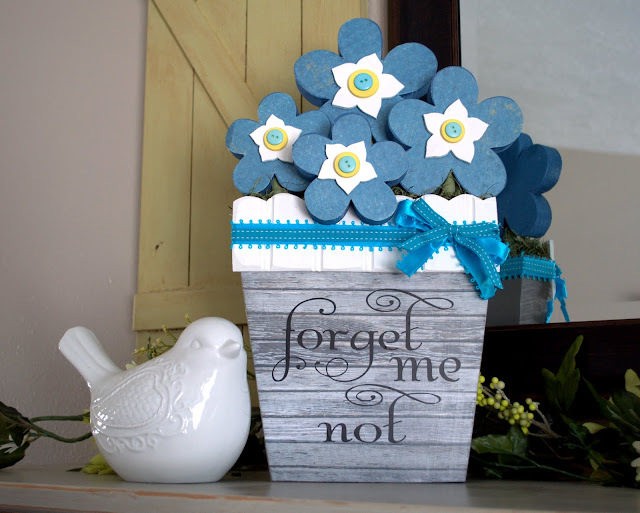 I ended up buying the "Forget me not" kit. 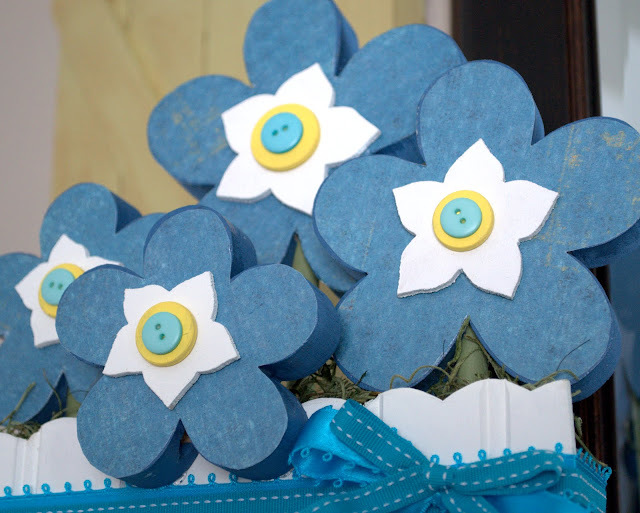 It's this sweet pot of little blue "forget-me-not" flowers to help us remember the beautiful talk by President Uchtdorf. 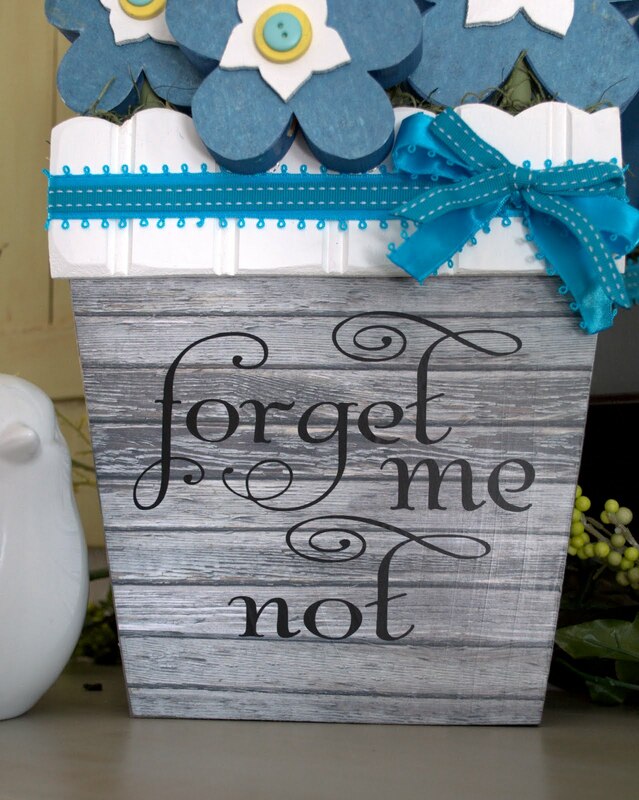 I particularly love this talk and wanted the oh-so-cute reminder in my home. 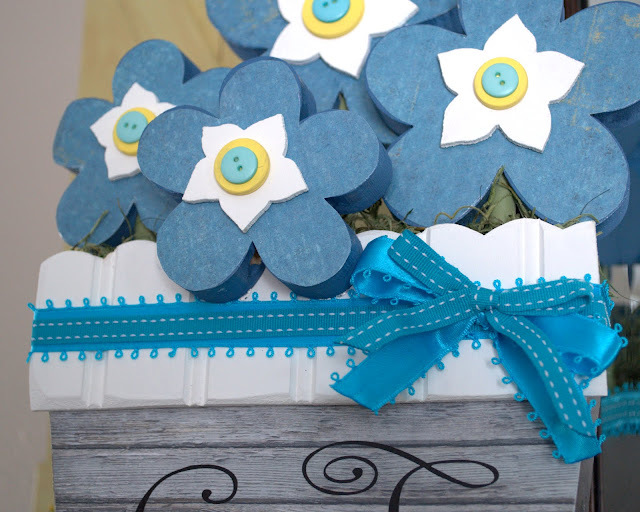 I found a perfect blue paper with some texture to modge podge on the flowers, and then added the button in the center for that extra fun touch. And I'm loving the double ribbon I found. The ribbon was the perfect way of adding that bit of aqua to the other truer blue, which helps it relate with the colors of my house. But I think the barn wood paper on the pot is the best part of all! The vinyl was already cut and I purchased it from The Wood Connection also. What a time saver! So... what do you think?! Turned out pretty fun huh! Well... I wasn't able to get out of there with only one kit so I'll be back in as few days with the other thing I made. Stay tuned!